Countries operate on a financial scale many orders of magnitude greater than even the largest companies or most affluent individuals. The first remedial action is typically to introduce more money into the system. Need more money? Just print more, and more, and more… However, the resulting inflation serves only to steadily push the economy down the spiral of devaluation. It may seem like a temporary fix, but hyperinflation inevitably looms on the horizon if this process continues unabated. When wheelbarrows of near-worthless currencies are required as payment for a loaf of bread, which has happened in recent world history and even in parts of the world today, the end of the line has been reached. This appears to be the path of the US dollar, the Euro, the Yen and many other monetary systems. Currency values seem to travel in ONLY one direction. Look no farther than the cost of any commodity over the any number of years. 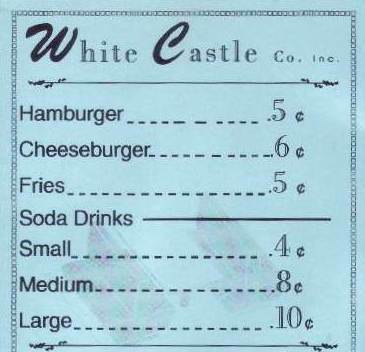 In 1952, a White Castle cheeseburger and fries cost 11 cents! It is ludicrous to expect a cheeseburger and fries to ever cost 11 cents again, anywhere. We’ve created trillions and trillions, dozens of trillions, almost hundreds of trillions of dollars, of obligations that simply can never be repaid. So this is how global currencies crash, after which central banks have to appeal to a gold-backed monetary system. According to some speculators, an ounce of gold could potentially cost $10,000 when this finally happens. If you took the global money supply and backed it with just 40% in gold, that would be the resulting value of just one ounce! Metro Pawn & Gun is a great place to buy, pawn and sell gold. Tried and true over any span of time, anywhere in the world, gold maintains its value while currencies come and go, empires rise and fall, and world events shape history. It is among the best investments you can make, so stop in and see what we have to offer!